teach balanced seat riding so you can become a safe and accomplished rider and be one with your horse. Meet our lesson horses and ponies. Private and group instruction is available. Ship in lessons welcome. Louise will also travel to teach at your farm. $30.00 per hour for 2 to 4 adults (horses). $30.00 per hour for 2 to 4 children (ponies). New clients, Pay for ten group lessons and get a $5 discount for each lesson, private or group.- See our coupons. We have established lessons that we can work you into if you want to do a group lesson. Our groups are no more than 4 people. Everyone is taught at their pace and level. Lessons must be paid in advance after the first lesson. Make up lessons are available if canceled. Must give 24 hours notice to cancel or forfeit lesson. 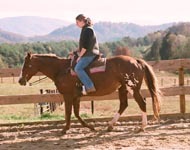 Click here for coupons for riding lessons. We have beginner ponies and horses for both children and adults. We start children from ages 5 years old and up. 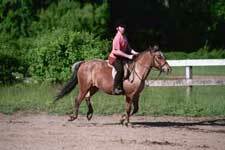 For the beginner you will learn handling the horse from the ground, safety, grooming, equipment, and basic riding. You ride the same horse every week so you can develop a relationship and have more understanding of your horse or pony's own unique personality. We have riding helmets available for use free of charge and some sizes in ridng boots. No need to purchase equipment. Move on to the various skills you need to advance your riding. Each person is taught as an individual even in our groups of two to four so you can increase your skills at your own comfort level. 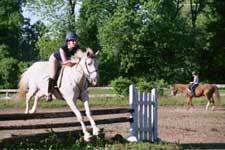 You can become proficient at everything from going an a trail ride in rough terrain to developing your skills at jumping or dressage. 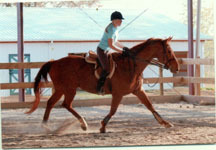 Our horses have years of experiance and training so you can build confidence and feel safe and secure while you learn. 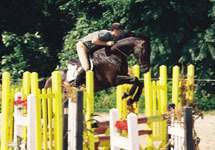 Focus on your specialty: Hunt Seat, Equitation, Balanced Seat, Dressage, Jumper, Pleasure, Western, Trail and Cross Country. 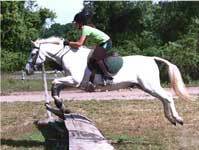 We travel to different sites for trail riding and go to local and rated shows. If you want to learn and not compete no problem I will be happy to teach you. challenged with the highly technical aspects of these sports.